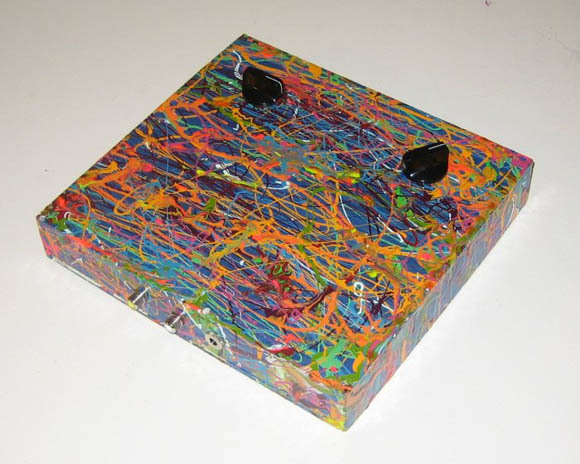 The Rocky Top video synths (the “splattered” model is shown above) are available for sale at US$280, in beautiful handmade boxes. I’m honestly often disappointed by very basic video effects, but these are really gorgeous and simple, made all the more irresistible by the great sounds they create. It’s all the nicer that the case reflects the visuals inside. 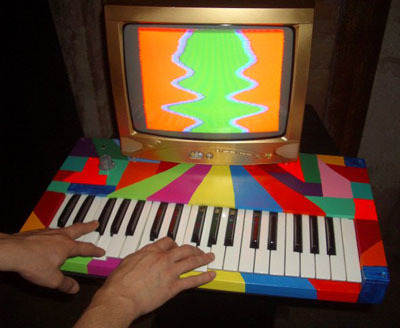 One thing I’ve discussed with the folks at Etsy is a desire for people making stuff that’s rare or ephemeral (as in the case of video and music) into something physical, and particularly for independent makers to be able to sell their wares. Derraindrop is doing just that. Other works from Derraindrop made their appearance at the recent NIME conference, a gathering devoted to new instruments and interfaces for music, for those of you not in the know. On tap was this fantastic video organ, hearkening back to some of the earliest instruments for synesthesia (long before electronics), along with video intercoms — basically synths with an intercom interface and handset for “private” experiences, TV boxes with tiny screens and big knobs, and, in the totally non-digital realm, big kinetic color wheel sculptures. I really enjoy the mix of electronics and craft here.